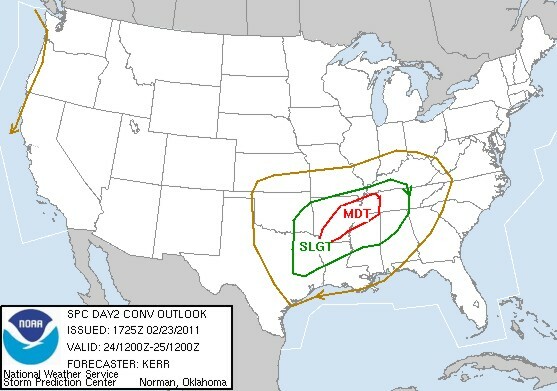 Another round of severe storms and potential tornadoes is possible March 7-9…. Excitement amongst the chasing community (I assume) is quite high after Sunday’s early season tornado-producing supercell. That storm raced quickly across the Oklahoma and Kansas border at 50 mph, but many chasers were still able to keep up with it’s high speed to capture images of the tornado that formed shortly before dark. But folks, I think mother nature has plans for another early season severe setup, and it seems to be focused on the early to mid part of next week. The reason I suspect more activity began from monitoring the series of deep troughs the GFS Operational and Ensemble computer models have been forecasting to dig into the western states early next week. But my curiosity grew when I saw the European Operational model from 12z Feb 28 (the Euro tends to perform better than say the GFS model) showing a deep surface low developing on Monday morning (March 7) over the Texas panhandle. If you look at the European Operational image below, you can see that not only is there a surface low deepening over the Texas panhandle on Monday morning, but there is another deep 500mb trough digging into the western U.S. To me, this implies there may be a two day severe storm setup across the southern plains early next week. But of course the battle with the ‘second day’ would be whether or not a cold front gets involved. Seeing the low 500mb heights over Montana and the Dakotas is not reassuring, to say the least, and suggest more cold air trying to bleed back into the plains right behind this low pressure system. 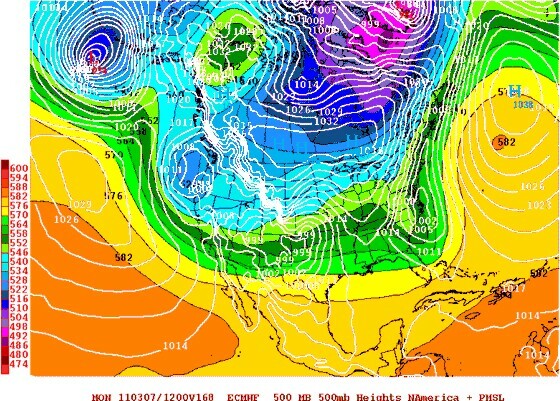 Next (below) is the European 850mb analysis for Monday morning. 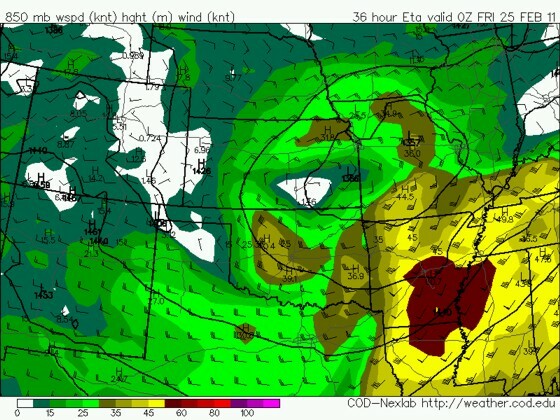 This shows a 40-50 knot 850mb jet out of the south over Texas, Oklahoma and Kansas. This would not only transport deep, low level moisture into the warm sector but also provide considerable wind shear that would support supercells and potentially tornadoes. We would also have to consider the moisture at the surface, but that is not available on the European model. However, if this did actually verify, it’s a good bet that sufficient low level moisture would become available considering the strength of this low level jet. I think the computer models should be monitored over the next several days to see what exactly this series of deep upper troughs do next week. It seems probable that at least one decent severe storm or chasing setup will occur early to mid next week across the southern plains. What it will come down to is the timing of the individual shortwaves, and how quickly Gulf moisture returns to the north. But finally, the second potential setup would be contingent on how quickly arctic/cold air from Montana or the northern plains moves south toward the southern plains. All things considered, next week could get interesting! Early this morning the Storm Prediction Center issued a moderate risk (see image above) for severe storms and tornadoes across the eastern half of Arkansas into western Tennessee and Mississippi. Their forecast updated this afternoon and is virtually unchanged, with the potential for large hail, damaging winds, and one or two strong tornadoes. The two main ingredients that will bring things together to produce severe storms will be very strong deep layer shear and strong upper air forcing. 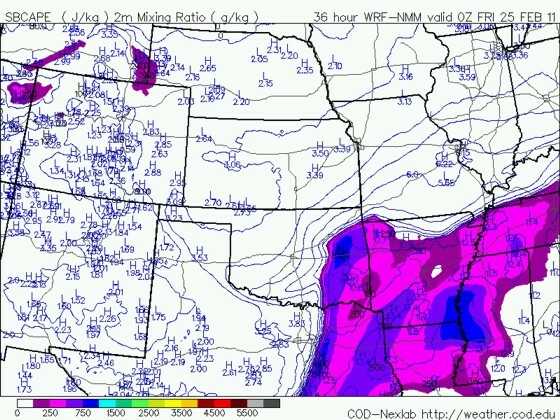 Below is the WRF 850mb chart for 00z Feb 25 (tomorrow evening at 6 p.m. CST). 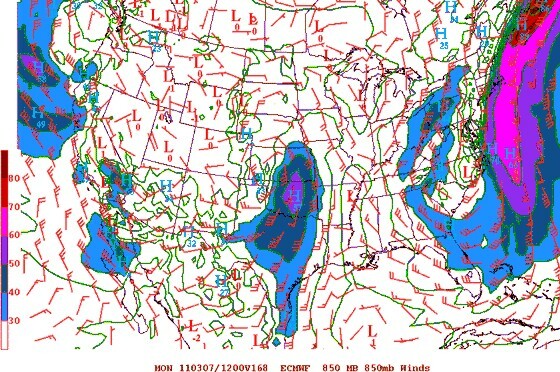 Notice the southeastern half of Arkansas is covered with a 50 knot jet out of the south-southwest. Given 700-500mb winds are forecast to be southwesterly to west-southwesterly between 65 and 85 knots, wind shear profiles are not only supportive of supercell thunderstorms, but violent tornadoes. But instability may be an issue. As you can see from the WRF CAPE forecast (below), CAPE values are only expected to be generally in the 200-500 j/kg range. I wouldn’t take this verbatim right now, considering low to mid 60s dewpoints are forecast to reach the I-40 corridor by tomorrow afternoon, with cooling mid level temperatures as the upper trough rapidly approaches from the west. But, early morning convection/rain/clouds will be an issue as the warm front lifts northward throughout the day. So how much daytime heating actually occurs will likely dictate whether or not adequate instability develops to support sustained supercells and even potentially violent tornadoes. WRF CAPE forecast issued 12z 2/23 valid 00z Fri 2/25. Below is the WRF precipitation forecast valid 00z Feb 25. A squall line clearly develops from northeast Texas into central Arkansas extending into southeastern Missouri. This likely develops late in the afternoon along the pre-frontal trough over western or central Arkansas as the surface low tracks northeastward. Initially, the storms within the line may have a sizable distance between them — possibly for a few hours–, especially if the line/storms develop along the pre-frontal trough and not along the cold front. But with time the squall line will eventually transition from a broken line of supercells into some sort of a MCS, especially as the cold front catches up to the line, forcing more of a classic damaging wind event. Ahead of this squall line there will exist an extremely favorable shear environment for supercells and tornadoes. The problem once again could be meager instability. But the other issue will be the lack of any definitive surface boundary to initiate discrete storms. Though this could be a case where storms initiate from intense warm air advection within the 850mb jet anytime in the afternoon, or simply from large scale lift. In the former case it’s usually difficult for the storms to become surface based — thus their tornado potential is near zero in spite of the strong low level wind shear. In the latter case the large scale lift may not be adequate enough to develop a storm until the main vort max approaches — causing a squall line. In the end it seems most likely there will be a broken squall line developing late in the afternoon across western Arkansas, expanding rapidly to the east. This squall line will initially be quite broken, with low topped supercells potentially producing tornadoes where pockets of strong enough CAPE exist. But with time, this line will become solid and thus the tornado potential will slowly decrease into the evening/overnight hours. There may be some discrete storms that develop ahead of this line over central or eastern Arkansas, and any such storm that actually becomes established within the boundary layer will have excellent tornado potential. But my thinking is the majority of the tornadoes that occur tomorrow — and I do think there will be several — will be from a supercell that occurs within a broken squall line in central or eastern Arkansas very late in the afternoon or early in the evening. One thing to keep in mind is all the storms will be low topped. Anytime you are expecting CAPE values to peak in the 500-700 j/kg range with 500mb winds in excess of 70 mph, no storm tops will exceed 40,000 feet. By the same token, storm motion is going to be greater than 50 mph. Below is the forecast hodograph for Pine Bluff Arkansas at 6 p.m. tomorrow evening. Notice the large amount of curvature from the surface to 700mb. This particular hodograph is very conducive to producing violent tornadoes. But I still think one big factor that may keep this setup from being a major outbreak will be the limited instability, despite the fact that wind shear will help negate that somewhat. The degree of solar radiation that occurs tomorrow across central/southern/eastern Arkansas will be a significant determining factor on whether or not there are several tornadoes — some violent– across those regions tomorrow. 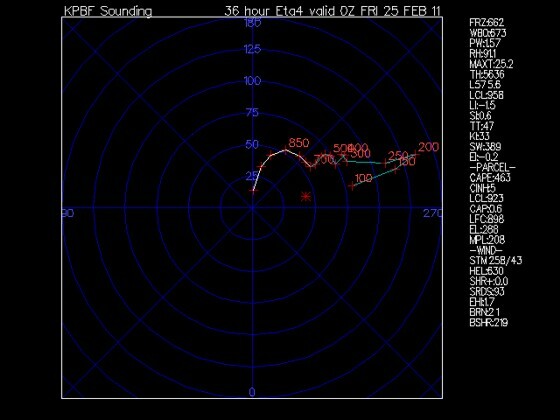 WRF Pine Bluff hodograph forecast for 00z Fri 2/25. This will probably be a very difficult storm chase for anyone heading out to Arkansas tomorrow. We are talking about a very fast storm motion and a rather sloppy/random storm initiation, with two main areas to watch. The first is the ‘random’ or ‘pop-up’ storms that could form anywhere in the warm sector from warm advection or large scale lift all across the eastern half of Arkansas. Playing this area is risky, but if a discrete storm does form and becomes established in the boundary layer, it could pay off. The other area to consider — and probably the better choice — is central Arkansas along the pre-frontal trough. At least this way you know approximately where storms will certainly develop. The problem here is supercells will form into a solid squall line with time. So the key would be to be on the storms as soon as they get their acts together. In both cases you are dealing with fast moving storms in a state that — unless you are in the right areas — has a horrible road network and bad chase terrain. Good luck to chasers out there tomorrow and be safe! Tonight was a huge success. 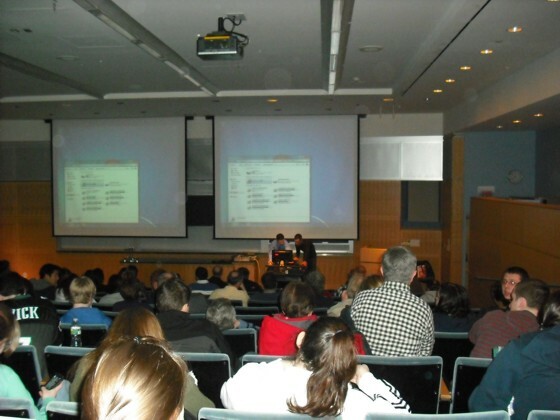 Over 120 people attended my presentation at WCSU in Danbury, CT which lasted over 90 minutes! Steve Barabas gave an excellent introduction for me, and I thought the entire event went very well. MaryLeigh took some still photos, which are posted below and at the top. The lighting in the room was not friendly to the camera, so please excuse us for non-professional quality here. Throughout the videos, which included supercell structure, hail, lighting and a bunch of tornado footage, I hope people learned a bit about storms and tornadoes, their dangers, risks and of course — what storm chasing REALLY is. 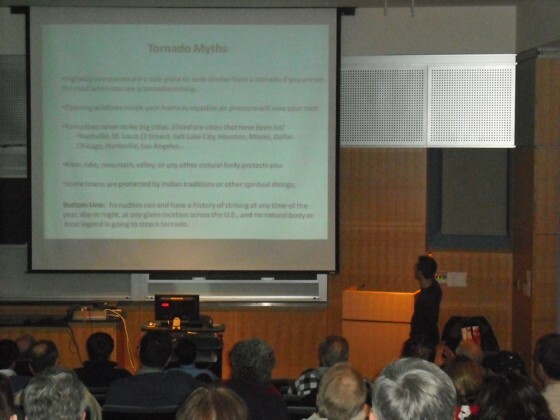 Thanks to everyone that attended my presentation and for those who purchased my tornado DVDs. 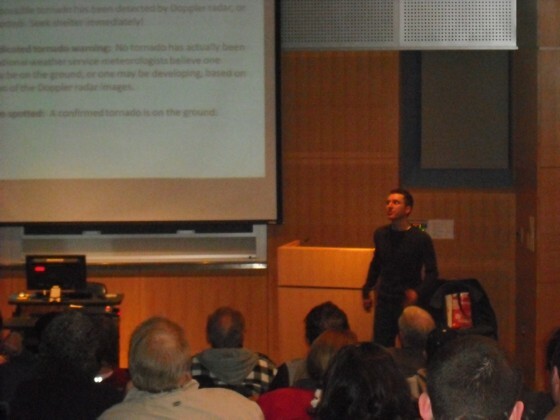 I also really appreciate how attentive this audience was, with several very good questions at the end of my talk. Thank you all! Steve Barabas introducing Jim Bishop. Jim Bishop talking to the audience. 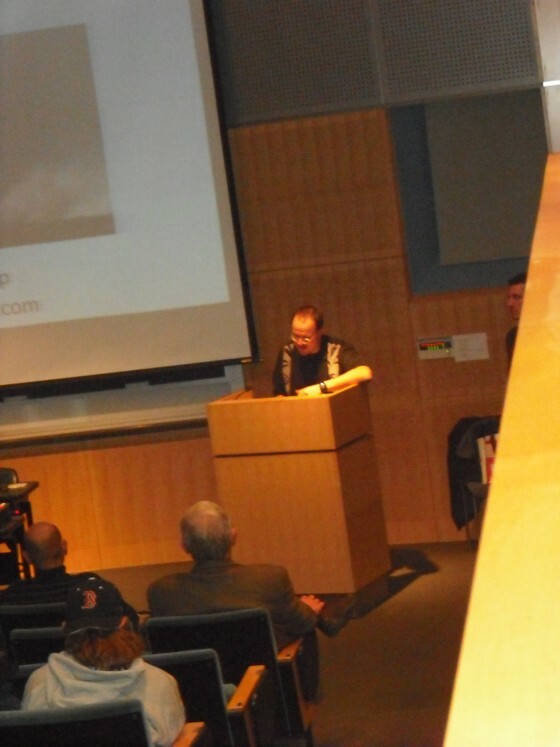 Jim Bishop talking about tornado myths to the audience. Thursday, February 17, 2011 at 7 p.m.
Jim will provide a presentation, followed by a viewing of his best tornado footage. A reception will follow. The event is free and open to the public. Jim Bishop is an experienced meteorologist who received his Bachelor of Science in Meteorology in 2004 from the University of Oklahoma. 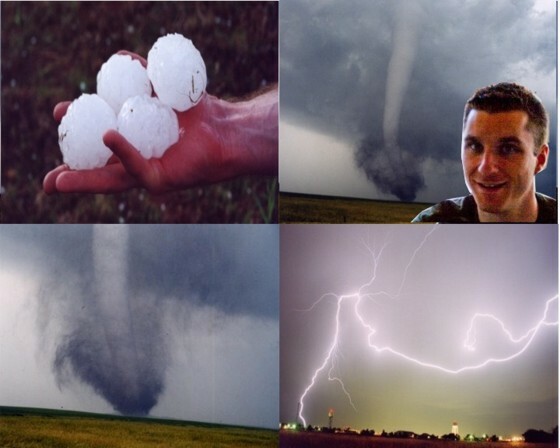 He has been storm chasing since 1999 and has seen over fifty tornadoes in his chasing career. Many of these tornadoes have gone down in history as some of the largest, most destructive, and even photogenic tornadoes of the last decade! Jim will begin his talk with severe weather and tornado safety, including many myths about tornadoes and the safest places to be during a tornado. He is then going to explain what real storm chasing is and what it really involves, and what knowledge and equipment is necessary to safely chase storms. Jim’s wife, MaryLeigh, will talk alongside Jim about what it’s been like over the years storm chasing as an individual with no prior weather knowledge. Finally, Jim will spend time showing some his most memorable tornado videos and explaining things while showing the video. Following the presentation, tornado DVDs will be on sale. During this time, Jim and MaryLeigh will be available for an informal question and answer session. Snow in Mesquite, TX Friday morning (2/4). Photo taken by Meggan Figueroa not long before a heavy snow band moved through. Winter has taken hold of much of the country, from the Great Plains, across the Midwest and Northeast, and even Texas! Temperatures this morning were in the teens in the Dallas area. 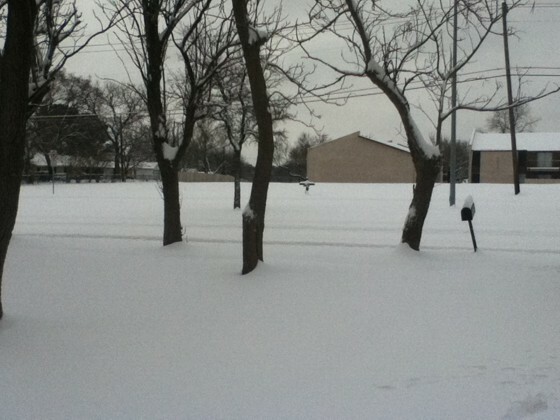 In Mesquite, TX, Meggan Figueroa took some pictures from her yard of the snow. I’m sure this seems like nothing for people seeing these pictures in Chicago or New York, where they have been measuring snow in feet this winter. 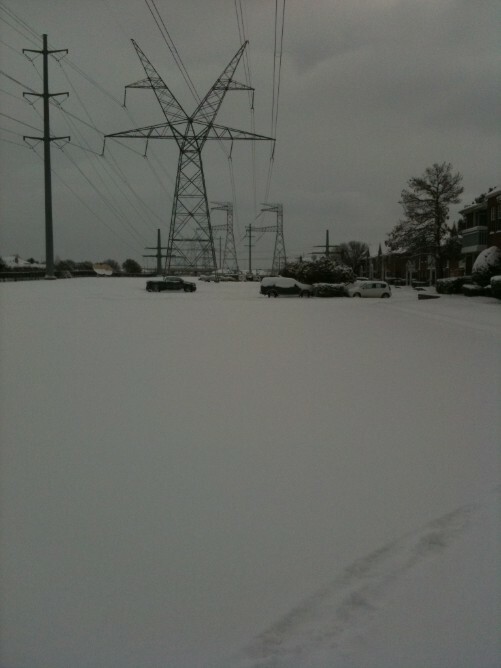 But Dallas has been pretty much shut down this week due to anywhere from two to six inches of snow. It’s not because residents of Dallas are terrified of snow, but it’s because the city and surrounding communities don’t typically see this kind of wintry precipitation, and simply are not prepared for it — and rightly so! For people in Dallas, this really is a big deal. 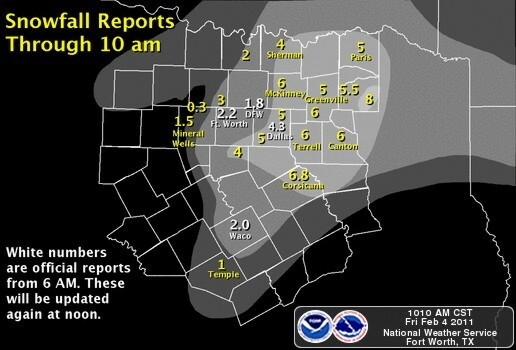 See the snowfall map for the north Texas area (below) from the NWS. Very impressive stuff. The snow pictures posted here from Mesquite were taken just before a heavy snow band moved through the entire Dallas area. This snow band may have placed another inch or two of snow on the ground, so it’s no wonder Dallas and most surrounding communities are taking another snow day. 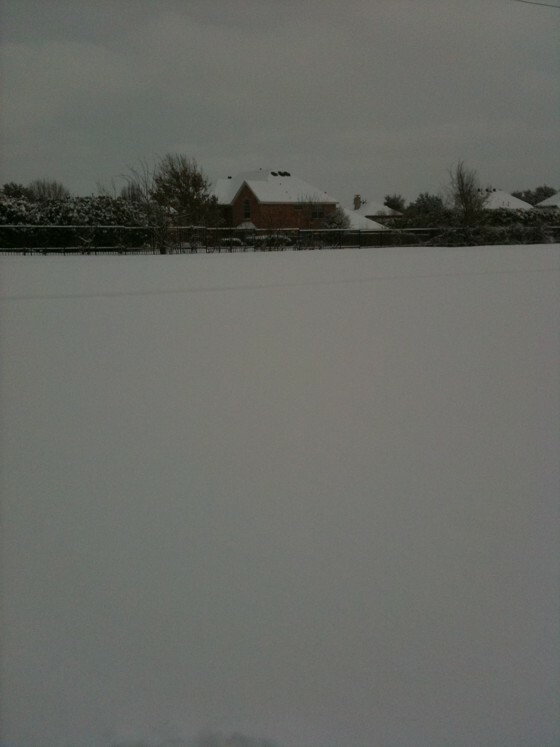 Thank you Meggan for sending in your snow pictures. It’s nice to see what others around the country are experiencing. Here in Connecticut, we’ve had enough snow, so I’m glad some of it has finally spread down your way! 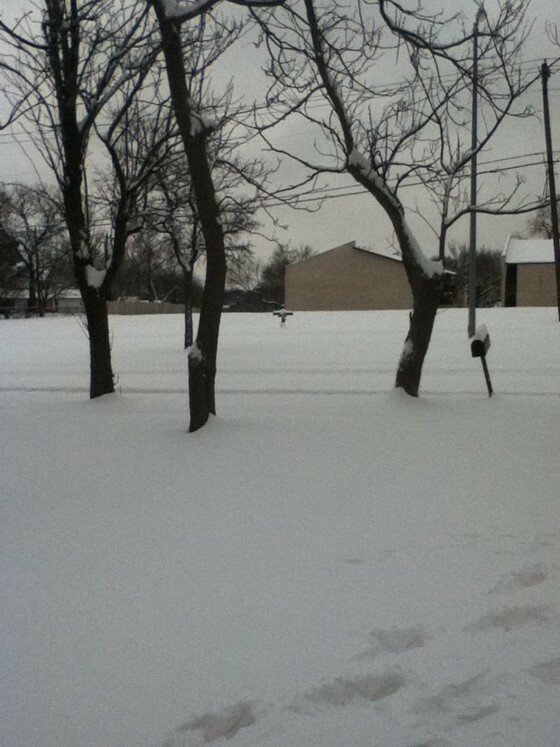 The two pictures below were also from the Dallas area Friday morning, and taken by Karen Thompson. Thanks for sending in your photos Karen! 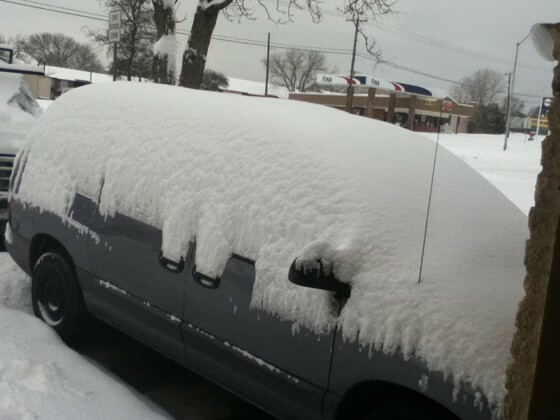 Photo from Dallas on Friday (2/4) in the morning. Photo taken by Karen Thompson. Dallas on Friday (2/4) in the morning. Photo taken by Karen Thompson. 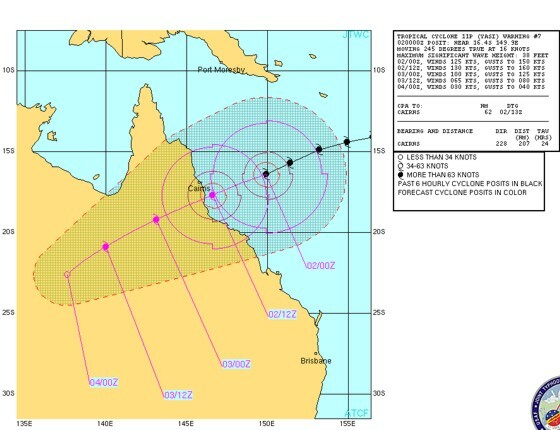 Category Four Tropical Cyclone Yasi (144 mph winds) to hit Queensland, Australia…. 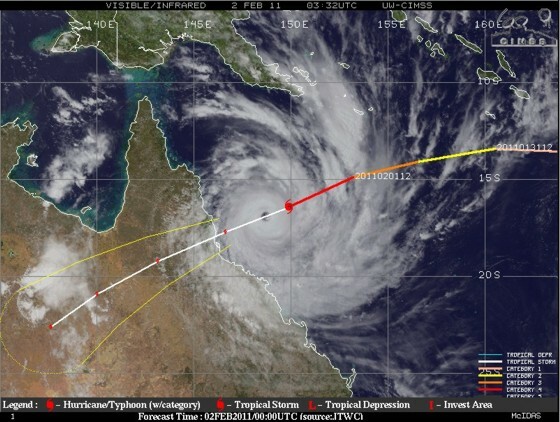 A significant tropical cyclone (Yasi) in the southwestern Pacific, with maximum sustained winds of 144 mph, is heading straight for Queensland Australia. Satellite images of this incredible storm are breathtaking, giving at least a nice break from the bitter cold and snow currently blanketing much of the central and eastern U.s. at this time. But residents in northeastern Australia are bracing for high winds, and along the coast have been dealing with intense storm surge for hours. It’s an interesting dichotomy when in the northern hemisphere you have an intense winter storm, producing blizzard conditions across the Great Plains and Midwest, and snow and ice storm conditions across the Northeast. 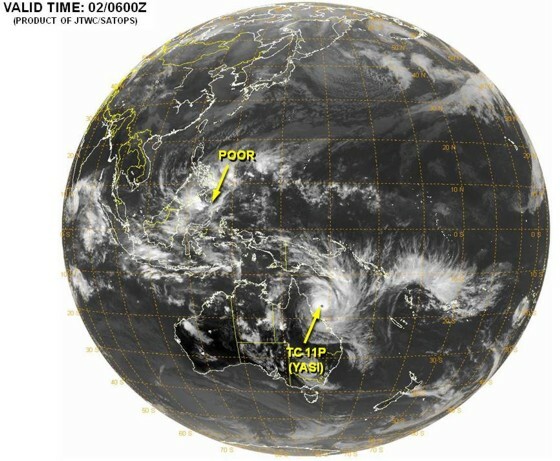 But on the entire other side of the world in Australia — the southern hemisphere — the atmosphere is reacting in another violent way by producing 144 mph sustained winds, and bringing severe storm surge and pending damage. 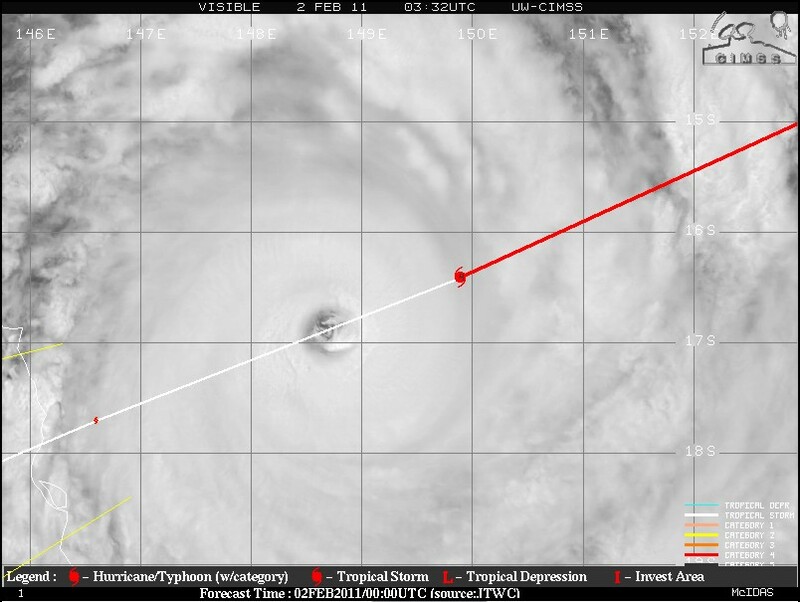 An infrared image of Cyclone Yasi valid 432 UTC. To me it’s fascinating that there can be such extremes on two different scales on two sides of the world simultaneously. But that’s what I love about weather, and why I’m not just a meteorologist, but a weather enthusiast. 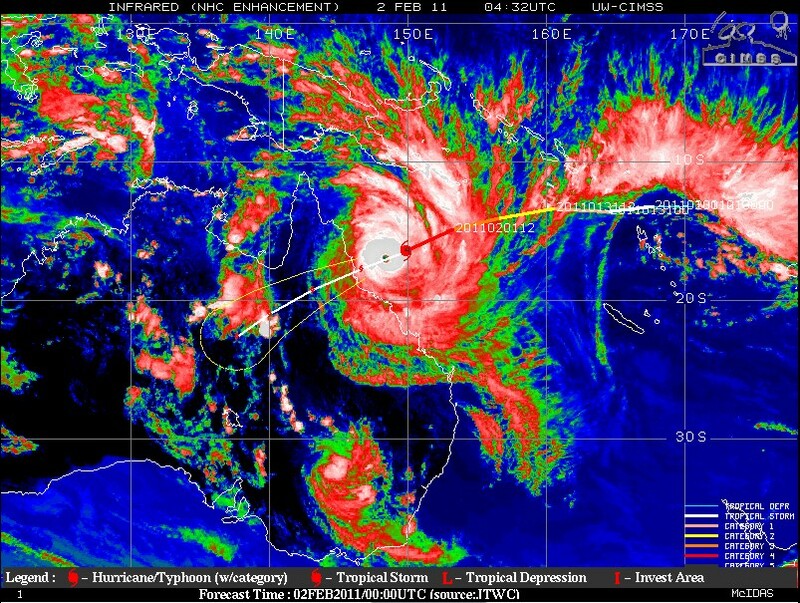 May the people of Queensland find shelter from this incredible tropical cyclone, and the residents across the Great Plains, Midwest and Northeast stay warm from yet another major winter storm. Next up — Great Plains tornadoes? Spring is just around the corner…..